Tuesday morning after my team meeting I headed north on I-81 to complete some mandatory lab work for my new job which begins June 14th. To put it politely, I peed in a cup, but with the lab work taking all of 5 minutes to complete I found myself in Roanoke and a perfect opportunity to get an afternoon ride in. 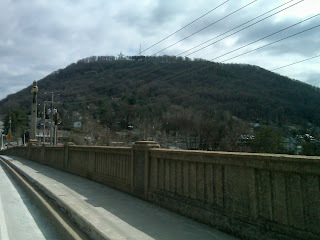 Mill Mountain looms above Roanoke with a towering star that serves as a bright red beacon at night. 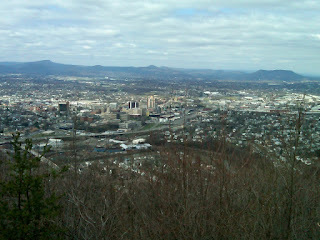 I drove to the top of Mill Mountain where there's a zoo and park as well as an access road to the Blue Ridge Parkway. I asked the local park staff for recommendations on which way to go and any construction concerns to be aware of, they suggested a common ride that I decided to take advantage of riding north on the parkway and taking 24 back. The short 3-mile access road to the parkway has an awesome decent at the beginning and then a nice little climb before you hit the parkway. Following the advice of the park employee I headed north on the parkway for a soon to be determined distance based on how I was feeling. 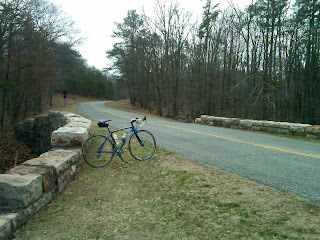 This was my first "ride" back on the bike since the W&M sketchy-sketchy-crashfest and my C&O adventures with Michelle which don't really count as training. 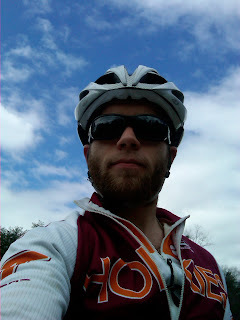 The weather for the day was pretty decent warming up significantly throughout my ride. One important note about the ride was that I had a guy ride up on my wheel and try to catch a draft not bothering to ask if it was okay to ride on my wheel. I usually wouldn't have a problem with this issue, but just ask, I've been there too when you're exhausted... but you don't just hop on to someones wheel without letting them know you're there. On the next significant climb I just pushed it a little and he was gone, better luck next time! At the turn around I decided to stop and take some photos of my ride and grab some water and food. The parkway was pretty dead all day and has a speed limit of 40MPH. I took this self portrait by just holding my cellphone, but the image looks really fake to me? 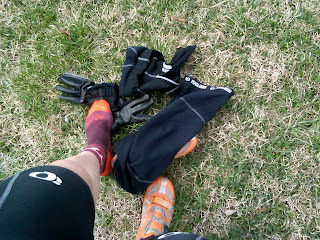 About halfway back I decided that a long sleeve jersey and legwarmers was way to much, so I ditched the warmers and gloves. I rode about halfway back on the parkway and then took Rt. 24 through Vinton into DT Roanoke which was alright but heavily trafficked with folks who apparently don't like cyclist, twice I was almost clipped by mirrors. The parkway has a good bit of elevation change, with almost 3,000ft. of climb in 37 miles. 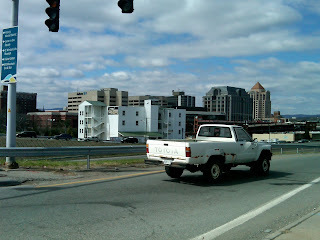 Tried to snag a shot of DT Roanoke as I was headed back into town at a light, silly truck got in my picture. The Star is where my car was parked, just one long climb until I was back. 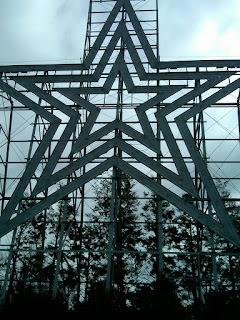 The star is pretty massive up close! The view from the Star, totally worth it! Power Data from the ride. It's nice to escape from Blacksburg every now and then and the routine of Mt. Tabor Rd. and Ellet Rd. It felt great to get back on the bike and I'm really excited about the upcoming weekend of cycling at UVA/VCU with two crits. 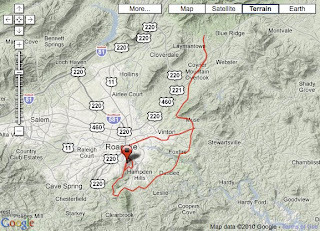 Posted by Unknown at 7:58 PM I'm reading from MyDailyGround: Blue Ridge Parkway training ride Tweet this! Week in review: A bust. Spring Break = Binge eating and not exercising. Week in Review + W&M Preview + Spring Break!